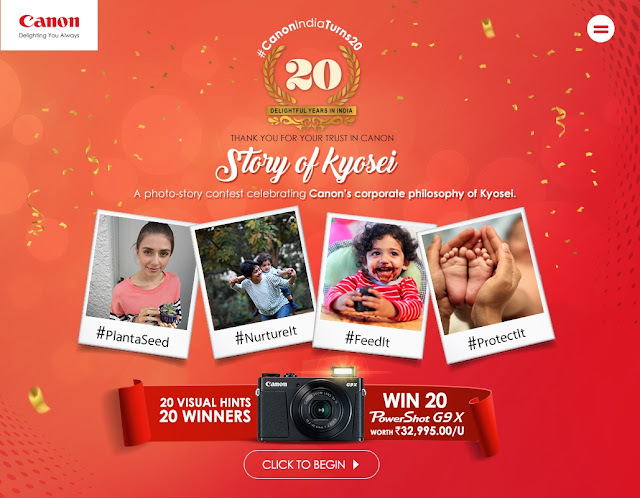 New Delhi, Feb 16, 2017: To embark the celebrations of two decades of its operations in India, Canon is running an online Photo story contest called “Story of Kyosei”. The theme ”Story of Kyosei” is conceptualised in line with Canon’s global brand philosophy derived from a Japanese word called ’Kyosei’ which means living and working in harmony for the common good irrespective of race, religion or culture. This digital photo contest is a unique opportunity for photo enthusiasts across the country to narrate their “Story of Kyosei “through their creative interpretation of the subject. Through this digital campaign, Canon India endeavours to take a step ahead in promoting the photo-culture in the country. The contest unfolds over 30 days as participants will be given 20 visual hints basis which they have to submit their entries. These visual hints are conceptualised upholding the pillars of the Kyosei philosophy. The contest started on 30th January and will run until March 3, 2017. Canon is expecting close to 10,000 entries from this contest. The submitted photographs will be judged by Canon panel of photography experts. Amalgamating the winner entries from each cue, the first photo story of Kyosei will be launched on 10th March 2017.